Robert Goodnough was born in upstate Cortland, New York. Though he later evolved into a full-blown abstractionist, while at Syracuse University, he worked realistically from casts and from life. 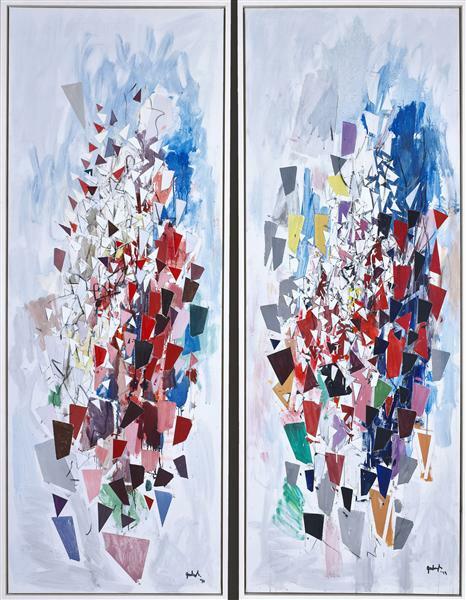 His move toward abstraction began with study with Amedee Ozenfant and Hans Hofmann in New York City, 1946-1947. Hofmann, at this time in America, probably had more to do with shifting young American painters away from making art from reality and realist thinking into abstraction than any other teacher of painting. Now living in New York City, Goodnough would later teach at Cornell University in Ithaca, New York, New York University and the Fieldston School in New York City. He also served as an art critic for Art News Magazine from 1950 to 1957. Goodnough became another of the tens of thousands of artists caught up in the Cubism of Pablo Picasso. He was also attracted by the stark abstractions Piet Mondrian. He combined these styles in the 1950s with that of Hofmann, his teacher, in a hybrid of Cubism and Abstract Expressionism. Since that time, like so many other abstractionists, Goodnough has been influenced by many abstract directions in art, including collage, sculpted constructions of birds and figures, and hard-edge paintings in the 1950s and 60s. From the 1970s, Goodnough has painted very large, geometric, abstract canvases. His work is in the following collections: Albright-Knox Art Gallery, Buffalo; Art Institute of Chicago; Baltimore Museum of Art; Birmingham Museum of Art, Alabama; Museum of Modern Art, Whitney Museum of American Art and Metropolitan Museum of Art, New York City; Museum of Fine Arts, Boston; Newark Museum, New Jersey; and the Rhode Island School of Design, Providence.